Explore the world famous 3 islands of the lagoon of Venice! Leaving from Treporti, you will visit Burano, Murano and Torcello, including a panoramic sail tour of St. Mark! Visit 3 islands in one day! This remarkable tour leaving from Treporti includes a visit to each of the three most famous islands of Venice.The first island will be Burano, this fishing island is famous for its handcrafted lace making, and many expert embroiderers weave an array of exquisite and finely detailed lace artifacts using the antique art of the bobbin. Torcello is the second largest island or as they said “Turricellum” the oldest and most prosperous settlement within the lagoon until the rise of Venice. 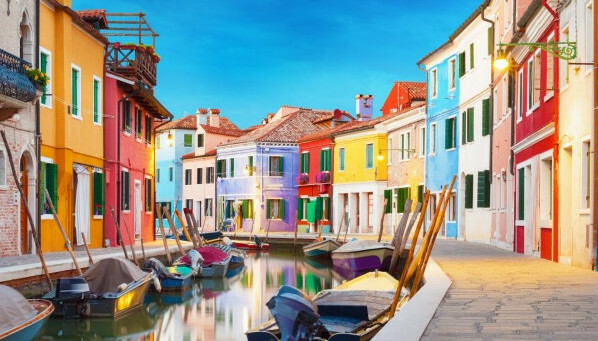 This island, just behind Burano, is famous for its cathedral with spectacular Byzantine gold and stone mosaics. In Torcello you will have time to have lunch in a typical local restaurant (not included). The tour will continue in Murano; the renowned glass blowing capital of the world. Preserved in time, and famous for its closely guarded ancient glass-blowing secrets, passed down from generation to generation by the masters. Skilled technics and expert craftsmanship have for centuries transformed this simple matter into art form.